The UFC 234 was held on February 10, 2019 at Rod Laver Arena in Melbourne, Australia. 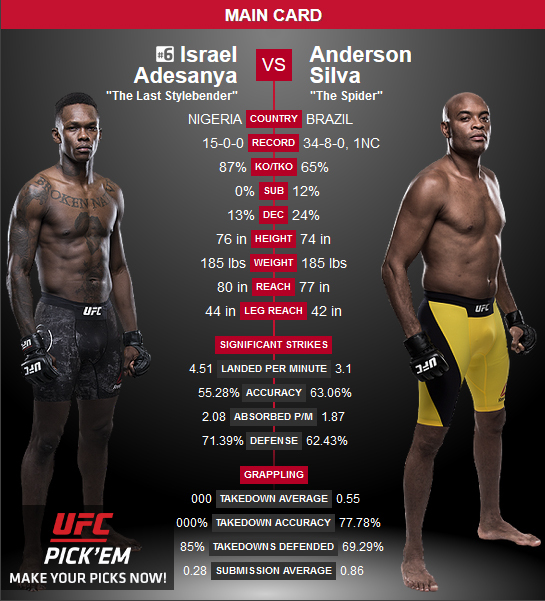 The main event featured the legendary fighter Anderson Silva and the undefeated Israel Adesanya, after the first headlining of the UFC pay-per-view event of the year was canceled just a few hours prior, due to an hernia and a twisted and collapsed bowel that forced Robert Whittaker —the current champion— to undergo emergency surgery later that day. He was supossed to face middleweight winner Kelvin Gastelum as the main event. Ryan Spann was also expected to face Jim Crute at the event. However, on January 25, it was reported that Spann was forced to pull out due to a hand injury and was replaced by Sam Alvey. In a similar fashion, Alex Gorgees was expected to face Jalin Turner at the event. However, it was reported that, on January 27, Gorgees was pulled from the card for an undisclosed reason and he was replaced by Callan Potter. Sign up with Sportbet today! *Fights labeled as "may not be broadcast" are scheduled to take place before the live broadcast begins. These pre-recorded fights are inserted into the broadcast if time permits. However, due to broadcast time constraints some of these undercard bouts may not be seen on a broadcast. These additional bout can be found as bonus footage on the event DVD.